Modern construction techniques create problems when rooflines are not properly sealed and soffits do not extend to the roof shingles. 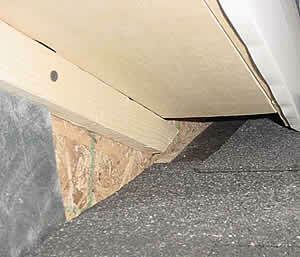 This creates an access point for many species of wildlife to enter the home and leads directly to the attic or soffit. Many of these entry points are concealed from view, either by a connecting roofline that is not visible from the ground or hidden inside a gutter. Properly sealed roof lines will prevent wildlife such as birds and squirrels from nesting as well as the added benefit of sealing the home from the elements. A properly sealed home will use less energy and save you money on utility bills. Homes today have many features that are conducive to numerous openings. For example, if you have 4 dormers on your home, there could be 8 openings. Add to that the normal roof connections and it is not uncommon to have the potential for 12 or more openings on the average home! By securing these areas after we have completed the wildlife removal process, your home or business will be sealed from the elements and protected against wildlife living in your attic or soffits. Protect your home or business through proper roofline flashing to prevent bird, squirrel, Opossum and Raccoon Entry.